Colour: Black anodized finish for those who prefer keep things a little more clandestine. VTA or Recirculation: 100% recirculation only. Vent to atmosphere or blow off valves are not compatible with Saab Trionic 7 engine management. Will hold for unlimited boost! Designed to replace the stock Bosch diverter valve on applications like Audi, Ford, SAAB, VW but with the TMS advantage. Fitting instructions with detailed instructions for how you set the spring pre-load. What’s TMS? GFB’s Turbo Management System is the term we apply to our diverter valves that have features designed specifically for the purpose of turbo lag reduction. 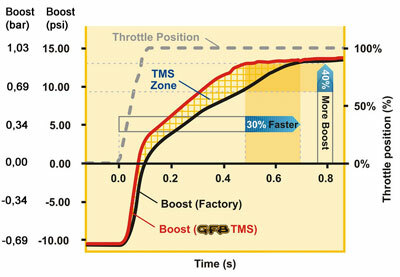 Tests show that TMS features can return the engine to peak boost up to 30% faster than a factory diverter valve when shifting gears*. How do I adjust the spring pressure to suit different boost levels? You don't need to! At full throttle there is equal boost pressure on both sides of the piston, so it doesn't matter what boost level you are running, the pressure balances itself out. It then requires very little spring pressure to stay shut. The spring adjustment is used to match the VACUUM signal of the car. The idea is to adjust the valve so that the piston remains just closed at idle. This way, when you lift off the pedal, the spring will be neutralized so that the boost is free to push the piston open. boost as you can throw at it, 24/7 - No frequent re-builds or replacement required. Better Response - Through reduced turbo lag! Better Drivability - Smoother than stock!